Cliff, Jimmy, OM: (Order Of Merit – highest honor granted by Jamaican government for the arts and sciences) Cliff was born James Chambers in 1948 and is noted for his outstanding musical career. Cliff was inducted into the Rock and Roll Hall of Fame in 2010. Artistes such as Annie Lennox, The Rolling Stones, Bruce Springsteen, and Cher have recorded some of his hits. My favourites include Oh How I Miss You, Sitting In Limbo and Brown Eyes. Many might know him for his version of the Hakuna Matata song on the Disney Album or from the movie The Harder They Come. The Calabash: (gourd) can harvested young as a vegetable. When mature, it is dried and used as a water vessel as the rind is waterproof. It is also used to make cups and bowls. Some are crafted into’ handbags’, which are mostly bought by tourists. In Africa, musical instruments are made from the Calabash. The Calabash has varied uses across, Africa, South America and the Caribbean. Wikipedia has extensive information. It is thought to have been carried to the western world from Africa and the word ‘Calabash’ comes from the Spanish word calabaza, with reference to the Arabic qar'a yabisa "dry gourd", and possibly kharabuz, from Persia. Calabash also represents a local literary festival. P.S. I may will be missing-in-action today, but not to worry, I'll catch up with you soon. Nice tribute to Jimmy Cliff. 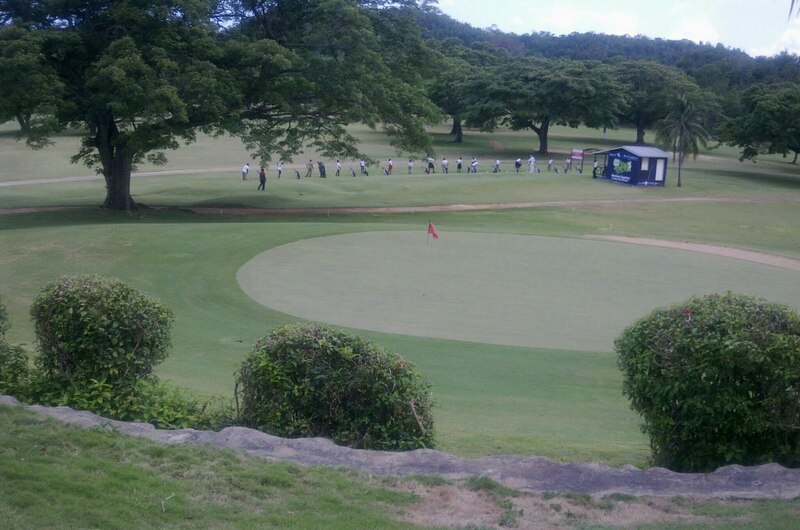 And that golf course looks inviting! And I never knew about the calabash. I've learned much here today. Thanks! Very interesting about the gourd! I'm hoping to visit all the blogs on the A-Z Challenge in April. I agree, a lovely tribute to Jimmy Cliff. Enjoyed info about the calabash. When we lived in Kenya, the gourd was used in so many ways. My Louisiana grandmother used to string long-necked gourds to dry for decorative color on the porch during the winter. I'm learning so much with each alphabet. Can't wait to learn more. I had no idea you could make a purse from this fruit thing. Interesting. I'd like to see one of those purses. Very informative! And Jamacia is beautiful place, indeed. So is Caymanas. The gourd is an integral part of African culture. Great info. Educational. Thank you. Your calabash gourd brought back some nice memories for me. My great-grandmother used to grow smaller gourds, which they used for water dippers when she was growing up. She'd always give us some for decoration in the fall. 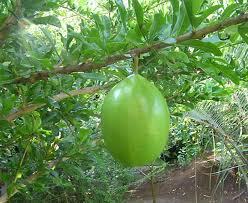 The calabash looks like a smooth version of the breadfruit you introduced to us in your previous post. They sound really useful. Ooh, I like your A-Z theme. I love the word calabash - I only learned it a couple of years ago. I still haven't seen one in real life! More Jamaican facts. We have Calabash here too, but not Jimmy Cliff (sigh). I've seen some really gorgeous carved calabash, as well as the handbags you mention and bird feeders. You'd never guess they were gourds! @Sharkbytes Thanks for stopping in. I'm hoping to visit as many blogs as I can too. Hi, Kittie, thanks so much for visiting. I learned a lot about the Calabash and its varied uses in putting together the info I did. Hey, Angela, I'll have a lot of catcing up to do tomorrow. Mike, oh yes, I was amazed by the array of things I saw on the net and I have seen the handbag thingie in the Craft Market. Thanks, Shelly, glad you for this interesting. Hi, MIchelle, I like all the artistes you mentioned too. Glad you're enjoying the visit. Hey, Peaches, thanks for coming by. 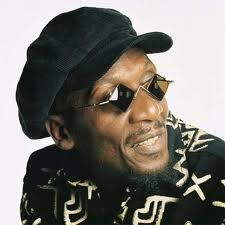 Tina, I agree with your coment on Jimmy Cliff. Interesting that gourds are used in so many ways in different places. Lynda, that's true and the gourd is indeed useful. Glad you found this interesting, Denise. Sorry to hear that. I'll bet that singer had a career that spanned many years. Farawayeyes, your comment made me chuckle. We don't have Jimmy either, so we're even. I believe he now lives in Brazil. Gotta check my facts. Li, wow. I've never see a bird feeder made from a calabash. You live and your learn. Nice tribute to Jimmy Cliff. Every time I read something that you write you make me want to go to Jamaica. I guess I just need to do it. This is very interesting indeed J.L thank you. I love the new look. Positively fierce. My absence in the blog world is showing. That's interesting about the calabash. 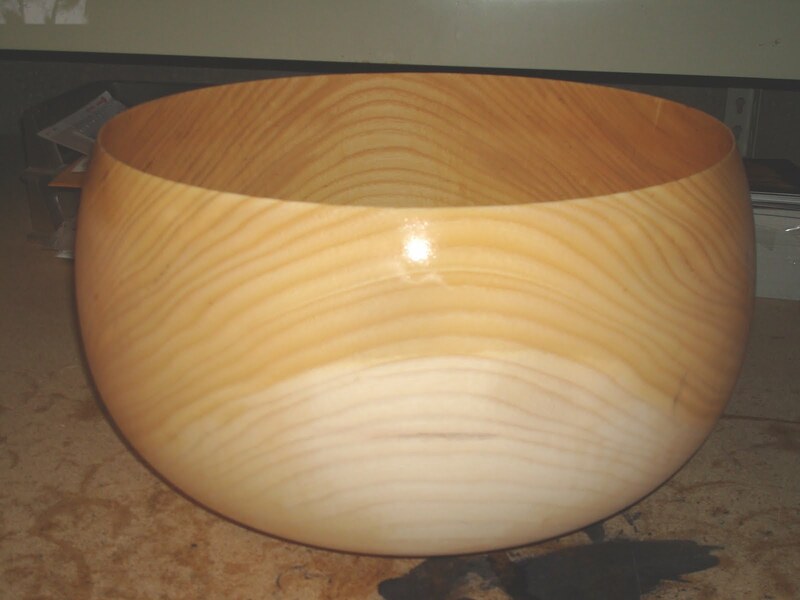 I first thought that bowl was made of wood. I'll check out Cliff's tunes. Melissa, I guess you should! Wendy, ya know you crossed my mind yesterday, but I had a humdinger of a meeting so didn't do much of anything else for the day. Glad to know you are well. Medeia, you're right, the finish of the bowls always impress me. I enjoy his music more than I can say, Sarah. 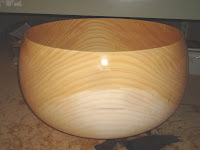 Enjoyed this c post, especially the information about the Calabash.